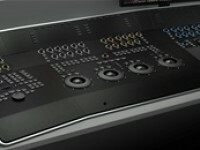 At IBC this year Digital Vision unveiled their new control surface for their Film Master finishing product: Precision. As I had been involved in the early design work, Simon Cuff of Digital Vision gave me a demonstration over beers after the show had closed one evening. It is a beautiful object in its own right, showing its Scandinavian design roots, but is also highly optimised for the user. Mostly black, as it needs to be in the grading environment, each button or knob can be illuminated for location and state. There is an clean and stylish steel edge around the whole unit which really makes it stand out as an object rather than as a part of the desk it sits upon. It has a combination of dedicated function buttons that allow the colorist to access key functionality with a single key stroke, through to configurable touch displays and control knobs that can control any parameter of any effect. Four rings and balls in the dead centre will be easily accessible by both right and left-handed users, and a large touch display for menus and keyboard. The modular design means that it can be configured to meet the needs of the user, rather than being a monolithic “like it or leave it” slab. Great work DV, and an honour to have worked on the project. This entry was posted in past glories and tagged design, product, projects. Bookmark the permalink. Nice post Chris. I’ve always been impressed by the functional design of control surfaces when encountering them in facilities, so it’s interesting to get an insight into the creative process behind this. Thanks Michael, it was great fun to work on too.